NASA's WISE infrared space observatory mission team released this mosaic of the Soul Nebula (a.k.a. the Embryo Nebula, IC 1848, or W5) on April 2, 2010. The Soul Nebula is an open cluster of stars surrounded by a cloud of dust and gas over 150 light-years across and located about 6,500 light-years from Earth in the constellation Cassiopeia, near the Heart Nebula. The wispy tendrils of gas and dust that make up the heart ofthe distant Soul Nebula stand out in a recent photograph from a NASA spacetelescope. At 150 light-years across, the Soul Nebula is vast cloud ofdust and gas that surrounds a cluster of stars about 6,500 light-years fromEarth in constellation Cassiopeia. NASA's Wide-field Infrared Survey Explorer(WISE), an infrared space telescope, took the new Soul Nebula photoearlier this year and it was released in April. The image was part of a larger picture of the Heart and Soul Nebulas taken by WISE and featured today at presentation on the mission at the 216th meeting of the American Astronomical Society in Miami. The pillars are regions of the nebula that are dense enoughto resist the destructive effects of wind and ultraviolet radiation blowingfrom the center, where young stars are forming. Each tower is about 10 light-years tall and has starsforming at its tip. The stellar winds are also compressing material around theinterior edge of the nebula,which is setting off a new round of star formation. Scientists estimate that the stars in the Soul Nebula, alsoknown as the Embryo Nebula or W5, formed about 1 million years ago. 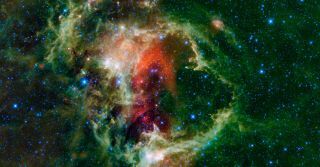 WISE used all four of its infrared detectors to create theSoul Nebula photo, pooling the blue and cyan wavelengths, which are primarilylight from stars, with green and red wavelengths that are primarily emissionsfrom warm dust. The $320 million space observatory launched in December tocompletely map the sky in unprecedented detail, as well as seek out unseenobjects like dark asteroids and bright stars and galaxies that are hidden byobscuring clouds of dust. The WISE observatory also beamed home striking photoof an asteroid passing in front of a much more distant nebula. That photoalso included some satellites, appearing as faint lines, thrown in for goodmeasure.